The number of complaints made against one health board and how these were dealt with is concerning, the public services ombudsman has said. There were 194 made against Betsi Cadwaladr in 2016-2017- the second highest health board had 107. 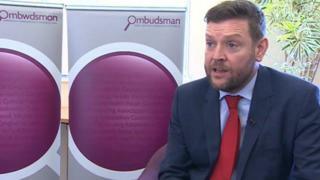 Ombudsman Nick Bennett highlighted three of these incidents, all involving Glan Clwyd Hospital, Denbighshire. A Betsi Cadwaladr spokeswoman said it takes all complaints seriously and they help it find ways to improve services. There were 702 cases closed across Wales in 2016-17, with 194 complaints involving Betsi Cadwaladr, 107 from Abertawe Bro Morgannwg, 102 from Hywel Dda and 93 from Cardiff and Vale. "I am concerned about both the volume and outcome of complaints against Betsi Cadwaladr University Health Board over the past 12 months," Mr Bennett said. He issued five health public interest reports about serious cases over the course of the year and three involved Glan Clwyd Hospital in Denbighshire. In the first, Mr Bennett said Betsi Cadwaladr should pay £20,000 to the wife of a hospital patient who did not see a consultant for 12 hours and later died. Another related to "fundamental clinical shortcomings" when a bowel cancer patient died after being admitted for surgery. The third was about a patient with a potentially life-threatening cancer who waited four months for his first treatment after a "disturbing lack of urgency". Redress payments to people who complained in the Betsi Cadwaladr area between April 2016 and March 2017 amounted to £61,999 in a Wales-wide total of £115,430. "While public services are facing unprecedented pressures, it is essential that lessons are learnt when things do go wrong," Mr Bennett added. "We have assigned an improvement officer to work alongside the health board and hope to see better complaint handling and learning as a result of that." A Welsh Government spokesman said this was a matter for the health board, but "we value feedback and encourage concerns to be raised as soon as possible so they can be dealt with quickly and easily so services can continuously learn and improve". Clwyd West AM Darren Millar said the complaints were a "cause for concern" given that the health board is in special measures. "Complaints are a warning sign that all is not well and I know from my own constituency casework that Betsi takes far too long to resolve problems and seems to make the same mistakes over and over again." He added: "The Welsh Government must ensure that the NHS in north Wales learns from things that go wrong and gets on top of this issue". Representatives of the board are also due to attend a health complaint handling seminar organised by the ombudsman next month. Gill Harris, executive director of nursing and midwifery, said: "Complaints provide us with an opportunity to look closely at the care we offer, and learn from the experience of our service users. We welcome and encourage people to use our concerns process so that we can investigate and provide the best care possible in the future. "Complaints is a key area for improvement under special measures and we are carrying out a significant programme of work to ensure our complaints procedures are as responsive and effective as possible. "This will include the introduction of a new Patient Advice and Support Service this summer to ensure we can respond to concerns in real time."